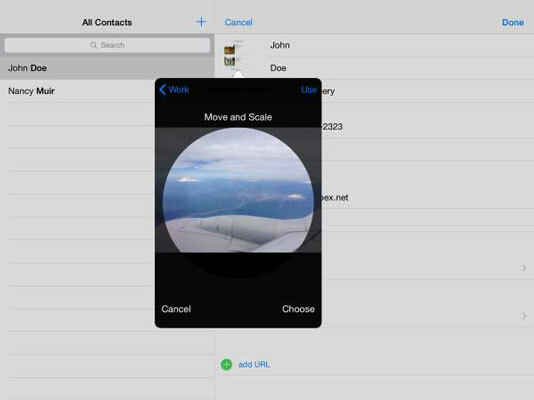 1With Contacts open, tap a contact to whose record you want to add a photo. 2In the settings that appear, tap Add Photo. 3Tap Choose Photo to choose an existing photo from the Photos Gallery. You can also choose Take Photo to take that contact’s photo on the spot using iPad’s camera. 4If you select Choose Photo, in the Photos popover that appears, choose a source for your photo (such as Recently Added or All Photos). In the photo album that appears, tap a photo to select it. The screen shown appears. 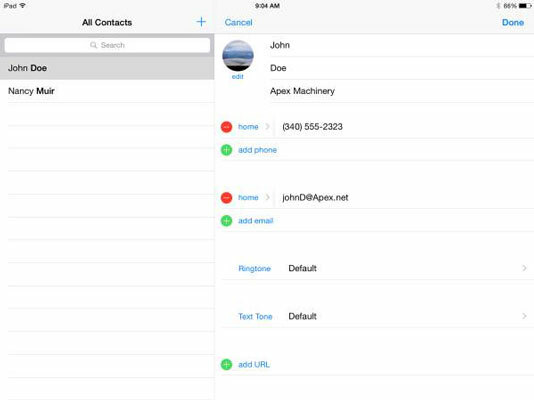 5Tap the Use button to use the photo for this contact. The photo appears on the contact’s details. 6Tap Done to save changes to the contact. 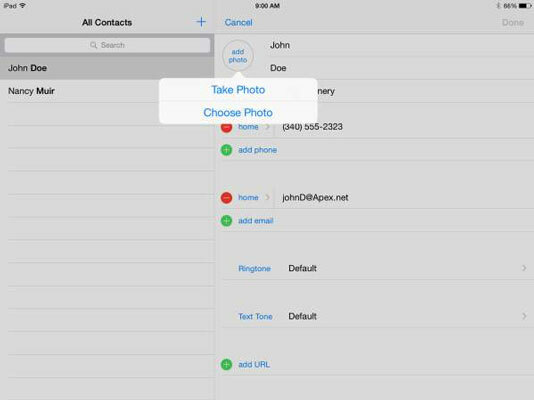 While you’re choosing a photo, you can modify the photo before saving it to the contact information. You can unpinch your fingers on the screen to expand the photo. You can also move the photo around the selected area with your finger to focus on a particular section and then tap the Use button to use the modified version.